This book feels like something I've been waiting for FOREVER. When I was in middle school, I really gravitated to everything Jackson 5... I was (and still am) enamored with the 1970’s but also, loved to see how much fun they appeared to have performing as a family. And let’s be real, the Jackson brothers looked like me, they were my age, and I related to their story. As a key member of the Jackson 5, Jermaine was the heartthrob with a mature and soulful sound likened to Marvin Gaye ...He is Michael's older brother, the second lead vocal of the group, and one of Michael's most recognizable "soldiers of love". Yet, Jermaine Jackson has been so often overlooked and misunderstood in the Michael Jackson fan community. I posted this photo of my Christmas tree last year. Would love to say that I've got a new one but, I will be reusing my old and faithful that is pictured above. Christmas has always been my favorite holiday and I can't wait until I get the chance to decorate and celebrate again! Here's a look back at my post about why the Jackson 5 Christmas Album will always be a special part of my holiday season. When I think of Christmases past, there are a few things that come to mind about the Christmas season in my childhood home. One would be how my younger sister and I would both sleep on the top bunk bed (mine), head to foot, on Christmas Eve. We could hardly contain our excitement and I guess sleeping together helped us sleep at least until sunrise. I also remember one time when my dad took out a garbage bag full of wrapping paper and gift boxes and I saw a bunch of cookie crumbs in a trail outside on our steps. Could it have been from Santa Claus? We thought it was! That made me believe in Santa for a few more years than I am comfortable admitting to on this blog (haha). One of the last memories that stand out in my mind is the soundtrack of Christmas season for my family as I remember it The Jackson 5 Christmas album. This was ALWAYS on. Of course, I remember the Alvin & The Chipmunks record also playing, as well as the Motown Christmas collection playing from time to time but, Michael Jackson's voice was a big part of the Christmas season for me. For those of you who may not be familiar with it, the Jackson 5 Christmas Album is as playful as it is traditional and festive. Songs like "I Saw Mommy Kissing Santa Claus" and "Up On The Housetop" are fun to listen to and always put me in a joyous and upbeat holiday mood, while "Someday at Christmas", "Give Love at Christmas Day", and "Little Drummer Boy" are traditional and must-haves throughout the season. As a high schooler, I began to learn more about the Jackson 5 and came to understand that they didn't even celebrate Christmas. Upon learning this, I became even more thankful for the beautiful songs that these young boys sang for families all over the world, without any experience of celebrating the holiday season. This brings to mind that famous quote of a young Michael Jackson saying "I don't sing it if I don't mean it". But how could he have meant what he sang if he'd never even celebrated Christmas? This beautiful talent, the talent to make us as listeners believe, understand, and identify with every word sung is so rare. The original album, clocking in at just under 35 minutes, has been remastered twice. The 2003 re-release included a track that was not included on the original, "Little Christmas Tree" and the 2009 re-release (my personal favorite) includes a few remixes, a stripped mix of "Someday at Christmas" and a group acapella of "Give Love on Christmas Day". I found myself listening to this album on the train (what inspired this post)- it always helps me get into the Christmas mood. For these same reasons, I imagine myself playing this same record (well CD... or MP3... or whatever) for my future children. I pray that they will be patient with their mom's unhealthy massive obsession with Michael Jackson and will appreciate the feel-good vibe of the Jackson 5 Christmas album. Don't have the album? Ultimate Christmas Collection -- Buy it Now! I would highly recommend the Jackson 5 Christmas album to any Michael Jackson fan who has not heard it already and I guarantee that it will become an album that will be on repeat during your holiday season. Jackson 5 Cartoon on DVD! This Animated Series Comes to DVD in January 2013! Okay guys, so I am coming to you with a fun announcement. I just found out that the Jackson 5 television animated series is coming to DVD in a few months! According to the TV Shows on DVD website, the Jackson 5 Cartoon series will be released in its entirety on January 15, 2013. The episodes will be available on either a 2 DVD set or a set of 4 Blu-Ray discs. I have told you guys before about how much I LOVE the Jackson 5 (it was actually how I became a Michael fan) so this is something I am really excited about. The site also states "The set -- which includes 23 full-length episodes -- is priced at $32.99 USD for the regular DVD (2 discs), and $39.99 USD for the Blu-ray (4 discs)." I am an 80's baby so I did not technically grow up on the Jackson 5 cartoons when they first aired but, I have this VHS tape that my dad used to record all of the episodes that used to rerun on BET Network on the 90s. As a child I would always go to my grandparents house on the weekends, and so many afternoons I remember were spent watching the few recorded episodes of the Jackson 5 cartoon. This had to be what I was watching when I was 5 or 6 years old so, know that when I say I have been a Michael Jackson stan all my life... I mean it. 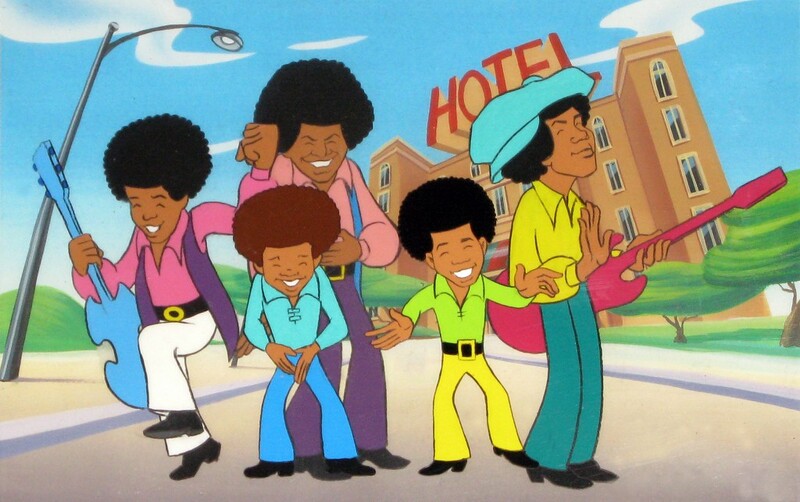 The Jackson 5 Cartoon was probably what helped peak my interest in the Jackson family as a child. Although it only aired for 2 seasons, the cool thing about the cartoon is that all of the brothers had unique characteristics that shone through in the cartoon. Michael even had a pet mouse and his pet snake Rosie- who both helped the boys get out of pinches when they needed assistance the most! I fondly remember my favorite episode of the series being one from the second season entitled, "Jackson and the Beanstalk". The episode features the songs "Love is Here and Now You're Gone" and "Girl, Don't Take Your Love from Me". I would highly recommend the J5 cartoon to those of you who have children that already love Michael Jackson but, you'd like to expose them to some of his earlier work. What are your favorite Jackson 5 cartoon moments? Leave me a comment! Jacksons Unity-- 3rd Time's A Charm! Yes, you can guess it! I went to see the Jacksons again and had a beautiful time! 3 times in less than 3 months has gotta be a record! Although my MJ Family and I had to wait for 4-5 hours (some waited almost 20-- but I wasn't brave enough) but I got 6th row seats! Did I mention the concert was free?! Here is the only other Jacksons shirt I have. It's a Vintage Victory Tour reproduction shirt and I got it online from PacSun a while back. It's a J5 Collection shirt so, they may be limited but, totally worth it if you can find one online! Sorry there are no shots of me wearing it! I didn't have the time or anyone to help take pics of me in the sweltering heat (smile). Some random shots I took of the night! Did anyone else see the Jacksons Free Concert and enjoy it as much as I did? Kudos to Brooklyn for being an awesome borough!